Udom Emmanuel, governor of Akwa Ibom state, stormed the state house of assembly on Tuesday as five lawmakers of the All Progressives Congress (APC) were allegedly plotting to oust him. The house has been enmeshed in a crisis since some of its members defected to the APC from the Peoples Democratic Party (PDP). Nse Ntuen of the APC and Onofiok Luke of the PDP are both laying claims to the leadership of the house. Luke convened the house last week Monday and suspended Ntuen along with four other members. He subsequently declared their seats vacant. But Ntuen convened another session the next and announced the suspension of Luke and 11 PDP lawmakers. There are 26 members of the assembly. The members suspended by Ntuen are Udo Akpan, Felicia Bassey, Nse Essien, Lawrence Udofia, Usoro Akpanusoh, Ime Okon, Friday Iwok, Asuquo Archibong, Mark Esset, Emmanuel Ekpenyong and Aniekan Uko. He also dissolved all standing committees constituted by Luke and adjourned plenary till December 4. On Tuesday, the five APC lawmakers met and commenced impeachment proceedings against Luke and the governor. 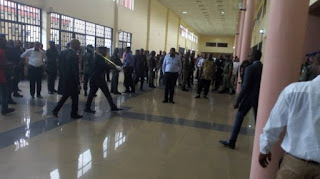 According to NAN, they arrived early at the assembly complex with heavily armed policemen and a mace to commence the impeachment of the governor. They reportedly chased everyone within the assembly complex out, manhandled Kufre Okon, press secretary to the speaker, and headed straight to the chambers. But Emmanuel arrived house during a rowdy session. His arrival was accompanied with gunshots fired by security personnel. Ntuen was said to have been harassed by security personnel in front of the assembly and his vehicle was destroyed while he escaped being mobbed by alleged supporters of the PDP.